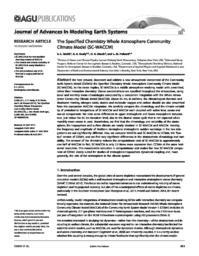 We here present, document and validate a new atmospheric component of the Community Earth System Model (CESM1): the Specified Chemistry Whole Atmosphere Community Climate Model (SC-WACCM). As the name implies, SC-WACCM is a middle atmosphere-resolving model with prescribed, rather than interactive chemistry. Ozone concentrations are specified throughout the atmosphere, using zonal and monthly mean climatologies computed by a companion integration with the Whole Atmosphere Community Climate Model (WACCM). Above 65 km, in addition, the climatological chemical and shortwave heating, nitrogen oxide, atomic and molecular oxygen and carbon dioxide are also prescribed from the companion WACCM integration. We carefully compare the climatology and the climate variability of preindustrial integrations of SC-WACCM and WACCM each coupled with active land, ocean and sea-ice components. We note some differences in upper stratospheric and lower mesospheric temperature, just below the 65 km transition level, due to the diurnal ozone cycle that is not captured when monthly mean ozone is used. Nonetheless, we find that the climatology and variability of the stratosphere, the troposphere and surface climate are nearly identical in SC-WACCM and WACCM. Notably, the frequency and amplitude of Northern Hemisphere stratospheric sudden warmings in the two integrations are not significantly different. Also, we compare WACCM and SC-WACCM to CCSM4, the “low-top” version of CESM1, and we find very significant differences in the stratospheric climatology and variability. The removal of the chemistry reduces the computational cost of SC-WACCM to approximately one half of WACCM: in fact, SC-WACCM is only 2.5 times more expensive than CCSM4 at the same horizontal resolution. This considerable reduction in computational cost makes the new SC-WACCM component of CESM1 ideally suited for studies of stratosphere-troposphere dynamical coupling and, more generally, the role of the stratosphere in the climate system.